Christmas is suppose to be a joyous occasion, but when I look at my bank account at this time of the year I disagree. It’s a tough time for everyone in terms of money, but particularly for students. 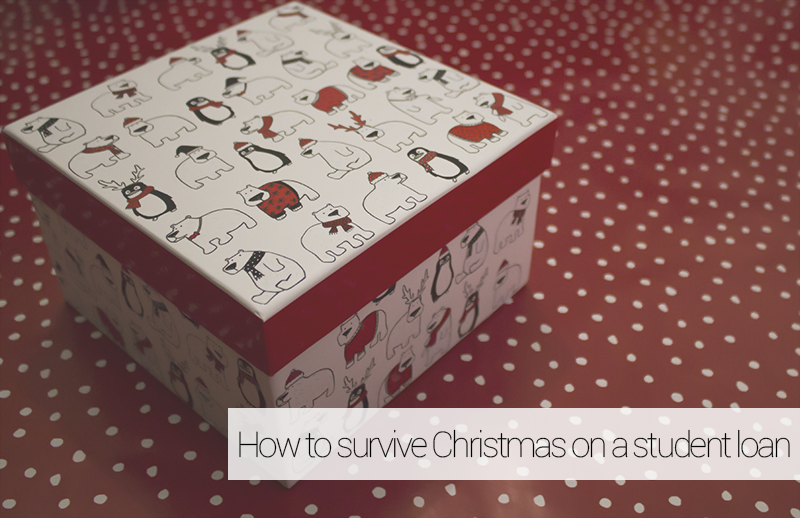 Today I’m going to share 5 tips to help you and your bank account to survive Christmas. 1. Don’t go overboard with spending. People understand that you are a student and therefore have little money to spend at Christmas. There is absolutely no point in getting yourself into financial difficulty over one day. Set yourself a limit for how much you can spend on each present and stick to it. If you do the maths and work out that your limit for each person is too high then adjust accordingly. It shouldn’t matter how much you spend on a person. After all, it’s the thought that counts. So you can’t afford presents? Why not hand make gifts! People really appreciate the fact you have taken time to make something for them and it can be so much more meaningful than a store bought gift. If you’ve got a large group of friends to buy for, or perhaps your flat mates, then you might want to consider doing a Secret Santa. Everyone gets a present plus you save lots of money. Also, getting together to share presents is a great way to end the year. 4. Go home and stock up. I don’t know about you but when I think of going home for Christmas I think about food. Lots and lots of branded food. It’s a novelty for us students! It’s almost a guarantee that food and drink will be left over, so pack yourself a goody bag of leftover chocolates, snacks and alcohol ready for going back to university. 5. Wait for the sales. When you are shopping for presents for others it can be very tempting to pick a few things up for yourself. Try your very best to avoid the extra spending on the run up to Christmas and wait until the sales. Also, it’s so much more satisfying to buy something in the sales that you were eyeing up before it was reduced. What are your tips for saving money at Christmas? I over spent on a couple of my friends but thankfully I could afford it. Sometimes there are presents that I just can’t resist purchasing! I’m pretty sure Christmas is harder now I’m not a student, I have no money! I’m preparing myself for the fact I might be on minimum wage once I graduate (because geography jobs don’t exist) and even though I will be better off on a minimum wage I will still be budgeting like crazy! This is some really good advice :-). I’m the awkward one in the group that just loves buying people christmas presents so always insist I’m getting them something (at least, small). It’s the one thing I tend to break the bank for! It’s always funny/awkward when you buy a present for someone and you can just tell by the look on their face that they haven’t got you a present! I’ve been home two days and I think that I’ve put on weight already. Thank you! I hope you have a great Christmas too! Your list summed up the tips quite nicely. I’d probably add on not worrying too much about presents at all, but that’s just me. I’m the type of person who prefers presence over presents [see what I did there? 😛 ]. In other words, I prefer spending time and making memories than buying gifts. This is mostly because when others ask me what I want, I just give them a blank stare. You can imagine how much more difficulty I’d have picking out presents for someone else! Ah, I love that idea! Im doing alot of homemade presents this year! Not only is it cheaper it feels more personal as well!